Prototype of a zoom lens for 4x5! Nex to the Fujifilm Square (showroom and gallery) in Roppongi, Tokyo, there is Photo History Musium where cameras and lenses that were epoch-making at various times in the history of photography. Among the displayed items, I found an abnormally large zoom designed for the 4x5 format. It is a 150-210mm/f5.6 constant aperture "standard" zoom. Here is a picture. Fuji's film SLR of a standard size should tell the size of the zoom and magnitude of my surprize. Re: Prototype of a zoom lens for 4x5! The Copal shutter would be a part of the front plate so the strain might be severe with that apparently heavy zoom lens. And considering the rather small size of prime lenses in this focal range, and the ease of snapping in or out a front plate with the respective lens mounted, I'm a little surprised the company went to the efforts of making that huge zoom lens. I did a lot of work in the film days with 150/5.6, 210/5.6, and 270/6.3 T-ED Nikkors on my 4x5" Arca-Swiss camera. If I deployed the 360/8 or 500/11 Nikkor-T ED, an extension bellows was required. "Front clear lens diameter is 50mm and rear clear lens diameter is 30mm. Barrel is 70mm diameter, Front lens shade is 85mm diameter." It appears to cover 4x5 only at one end. That small? Isn't it designed for the larger-than-life magnification only? 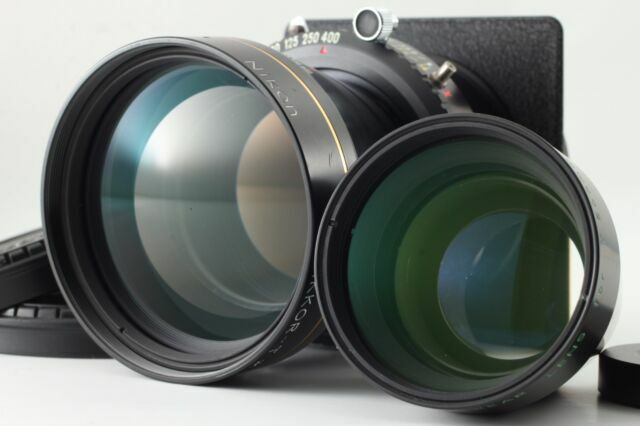 These are my long focal "twins" in the Nikkor-T ED line: 360mm f/8 and 500mm f/11. They had exchangeable dedicated rear sections that turned them from one focal length to the other. With a 30 cm long bellows they would work well on my Arca-Swiss 4x5" monorail and as they were relatively speaking "featherweights", usually no extra tripod support was required. There was a third sibling, the 720mm f/16 T-ED, which I skipped because it required more bellows draw than was practical in the field. As these lenses were true telephoto designs, one needed far less bellows extension than with standard long-focal lenses. Apparently, the front part of this field camera is detached in order to achieve the necessary extention?